[Evernote]able is a series of posts by Stacey Harmon sharing expert tips and details for those who are, or want to be, Evernote power users. Not signed up yet? Get an Evernote account here. Evernote has taken note formatting to the next level. 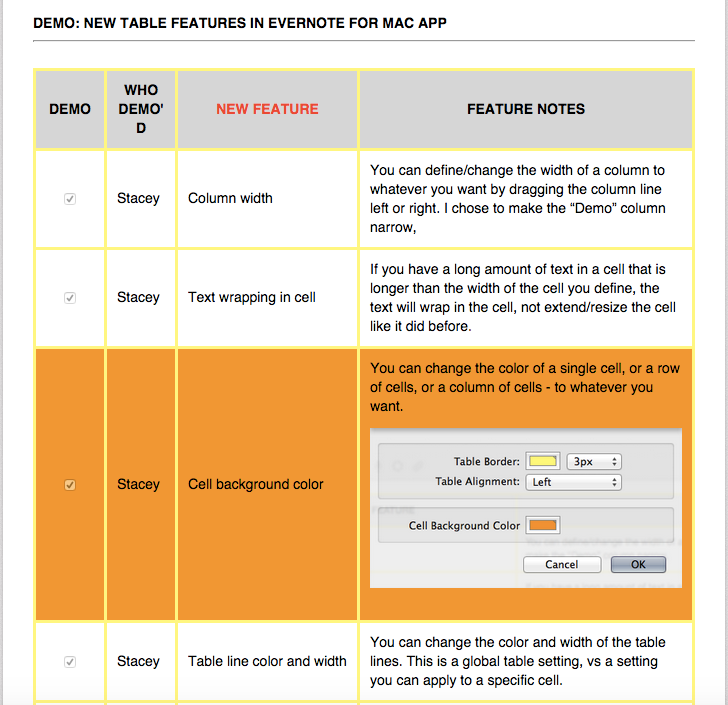 In a recent Mac update, Evernote expanded their existing formatting options and provided users with great improvements. Notably, the table function has been dramatically improved, allowing users to have more control over tables within their notes. Feature enhancements include the ability to resize note images - not only in the body of notes, but also within table cells, change the cell background and insert [and delete] columns and rows. View this demonstration note which illustrates the new table features and also provides a tutorial on how to use them in your own notes. You'll be using tables effortlessly in no time! The new table features open up a slew of creative options for your notes. One clever application includes creating a table with a white border (which makes it invisible) in order to add columns to a note. The example below shows this tip in action and is an easy way to create a photo showcase for a real estate listing - just create a 2 column table, turn the borders white, and insert images in the cell - you can resize them if need be. Have other creative uses that use the new table functionality? Share your ideas with me in the comments. Stacey Harmon is an Evernote Business Certified Consultant (EBCC), an Evernote Ambassador [one of 60 individuals worldwide selected by Evernote to share their expertise and passion for Evernote with its 100M+ user community], 2013 and 2014 Evernote Conference speaker and author of Untethered with Evernote: Tips and Workflows for Independent Entrepreneurs, now also available in Evernote's Market. Puzzled by Evernote? You Are Missing This Piece.